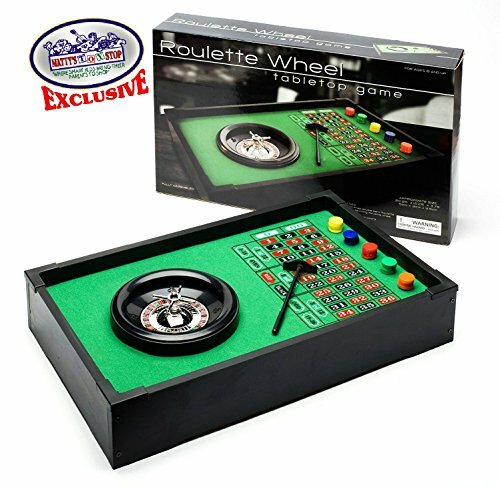 Matty's Toy Stop's Deluxe Table Top Roulette Wheel with 50 Chips, Rake, Spinning Wheel & Double Zero Style Felt Covered Wood Table is AWESOME! Great fun for all the family. Real roulette experience on your table top! Awesome casino style details, in the comfort of your own home! For 2 - 5 players - Perfect for travel too! Makes a great gift and is perfect for the holidays, family game night, casino night and so much more! For Ages 5 and up - Fun for the whole family! - Measures 20.25" x 12.25" x 3.15"
Awesome casino style details, in the comfort of your own home! For 2 - 5 players - Perfect for travel too! Makes a great gift and is perfect for the holidays, family game night, casino night and so much more! For Ages 5 and up - Fun for the whole family! - Measures 20.25" x 12.25" x 3.15"
If you have any questions about this product by Matty's Toy Stop, contact us by completing and submitting the form below. If you are looking for a specif part number, please include it with your message.